Box jellyfish are cnidarian invertebrates distinguished by their cube-shaped medusae. Box jellyfish are known for the extremely potent venom produced by some species. Chironex fleckeri, Carukia barnesi and Malo kingi are among the most venomous creatures in the world. Stings from these and a few other species in the class are extremely painful and sometimes fatal to humans. 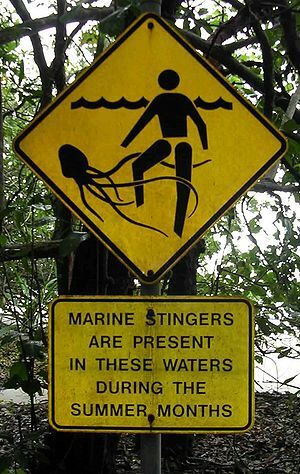 In fact, you are more likely to die from a box jellyfish sting than a shark attack. Of course sharks should be treated with respect, but it is a myth that most sharks are dangerous to humans. Box jellyfish have been known to kill people within three minutes after stinging. Although commonly recommended in folklore and even some papers on sting treatment, there is no scientific evidence that urine, ammonia, meat tenderizer, sodium bicarbonate, boric acid, lemon juice, fresh water, steroid cream, alcohol, cold packs, papaya, or hydrogen peroxide will disable further stinging, and these substances may even hasten the release of venom. Pressure immobilization bandages, methylated spirits, or vodka should never be used for jelly stings.In severe Chironex fleckeri stings cardiac arrest can occur quickly, so cardiopulmonary resuscitation (CPR) can be life saving and takes priority over all other treatment options. A heterogram is a word, phrase, or sentence in which no letter of the alphabet occurs more than once. An isogram, on the other hand, in which all letters occur an equal number of times, is the same as a heterogram when each letter occurs once. A heterogram may be distinguished from a pangram, which uses all of the letters of the alphabet (possibly more than once). A perfect heterogram is, however, the same as a perfect pangram, since both consist of all letters of the alphabet with each represented exactly once. A pangrammatic window is a stretch of naturally occurring text that contains all the letters in the alphabet. Generally, according to the law of probability, the shorter the work, the longer the pangrammatic window will be. Using the frequencies of the letters, it is easy to show this. For a sequence length m, the probability it will contain all 26 letters is P(a)P(b)…P(y)P(z) where P(n)=1-(1-p(n))m. Inputting the letter frequencies, the probability that a 1,700-letter sequence will contain all 26 letters is about 50%. At 1000, there is about a 19.5% chance, and at 2,500, there is about a 73% chance. Technically, the probability of a perfect pangrammatic window, i.e. one 26 letters long, is about 556 billion to one.